Thompson designs encompassed a small number of other vehicles including a six wheel CCT and a matchboarded brake produced just after the war when there were serious material shortages. The first Thompson designed vehicles produced after the war. The D.327 brakes were built using the Gresley chassis and, due to material shortages, matchboarded sides. Built in 1945/6 they survived into rail blue livery in the 1970s. The kit consists of a set of sides with integral floor, ends, underframe etches, white metal detailing parts, brass buffers, hand rail wire, plastic roof and ventilators. To complete the kit you need a pair of N gauge society 8ft Gresley bogies and wheels. A small amount of filling of the plastic roof is needed. 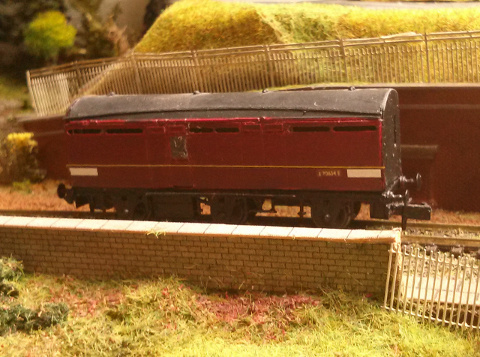 Suitable bogies include the N Gauge Society 8' Gresley Bogies. Some soldering is required for the solebars and steps, as well as filing work to tidy up the tabbed joins. Eighty of these six wheel vans were introduced in 1950, in a very similar style to the Thompson bogie coaches being built at the same time. They were the last six wheeled coaches built for British Rail. Although built to passenger standards they were banned from passenger services in 1959 but continued to see service in other trains until the mind 1970s. Most were scrapped by 1976 with a last few hanging on until 1980. Several were preserved for their underframes. Due to the poor quality timber used in the body framing only one complete van, E70654E, survives in preservation. It can be found on the Great Central Railway where it was restored. A full kit for the Thompson BR built six wheel BZ vans. This kit includes etched underframe and body, plastic roof profile, white metal fittings, brass buffers, plastic roof ventilators, bearings, coupling mounts coupling arms and wheels. As UME1144 but without the coupling mounts, couplers or wheels. Intended for those planning to build using 2mm fine scale wheels and couplings.